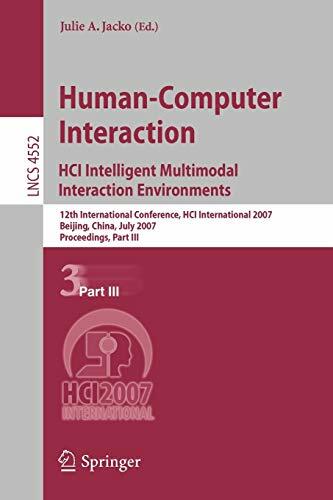 [PDF] Human-Computer Interaction.HCI Intelligent Multimodal Interaction Environments: 12th International Conference, HCI International 2007, Beijing, China, ... / Programming and Software Engineering) | Free eBooks Download - EBOOKEE! Description: Product Description: This four-volume set LNCS 4550-4553 constitutes the refereed proceedings of the 12th International Conference on Human-Computer Interaction, HCII 2007, held in Beijing, china, in July 2007, jointly with 8 other thematically similar conferences. The 513 revised papers presented in the four volumes were carefully reviewed and selected from numerous submissions. The papers accepted for presentation thoroughly cover the entire field of Human-Computer Interaction, addressing major advances in knowledge and effective use of computers in a variety of application areas. The 113 papers of this third volume are organized in topical sections on multimodality and conversational dialogue adaptive, intelligent and emotional user interfaces gesture and eye gaze recognition and interactive TV and media. 2017-10-19[PDF] Human-Computer Interaction: The Fundamentals Made Easy! No comments for "[PDF] Human-Computer Interaction.HCI Intelligent Multimodal Interaction Environments: 12th International Conference, HCI International 2007, Beijing, China, ... / Programming and Software Engineering)".